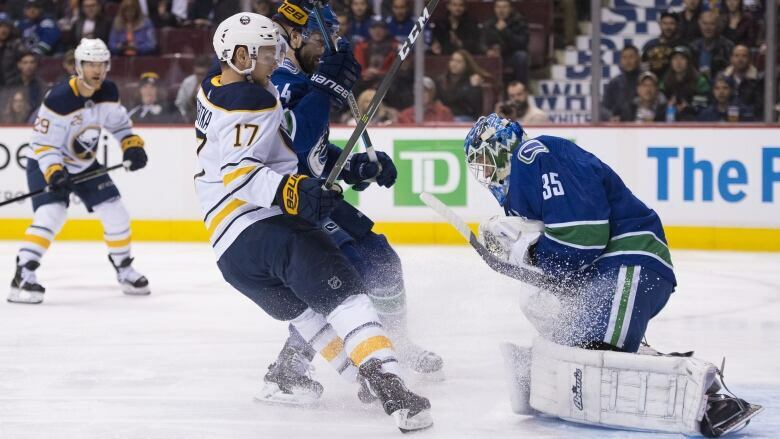 Goalie Thatcher Demko guided his Vancouver Canucks to a 4-3 win over the Buffalo Sabres on Friday night, stopping 36 of 39 shots in his second-ever NHL appearance. "I've been working hard and just patiently waiting for that first chance," said the 23-year-old. Demko — who played a single game for Vancouver last season — was called up from the American Hockey League's Utica Comets on Jan. 4 after the club traded backup netminder Anders Nilsson to the Ottawa Senators. "(Friday) opened up an opportunity for me," he said. "I'm just really excited and wanted to make the most of it." Demko ended up stopping 36-of-39 shots, guiding the Canucks to a 4-3 win. The performance had the crowd chanting "Dem-Ko!" in appreciation for some highlight reel-worthy stops. "He was great. Good to see. He was one of our best players tonight," Vancouver coach Travis Green said after the game. Bo Horvat had two assists, including one in the second period where he stripped Buffalo's Lawrence Pilut of the puck and made a beautiful pass to Boeser in front of the Sabres net. While he doesn't have a goal since Dec. 20, Horvat did notch his 200th NHL point on Friday. Despite the victory, the Canucks simply weren't good with the puck on Friday, Green said. "Probably half our team didn't play their best hockey game. And when you can not play your best and win, that's a real bonus in the NHL," he said. Demko kept the squad in a game that got off to an "ugly" start, said Horvat. "That's unbelievable. Especially at a young age, coming in. These are meaningful games and he stepped up like great players do and he played phenomenal tonight," he said. "We owe him a lot of credit." But the match up wasn't without mishaps. Late in the third period, Buffalo's rookie defenceman Rasmus Dahlin fired a laser at the Canucks net, catching Demko in the mask. "The puck caught me just above the eyebrow and the cage was actually touching my eyebrow and my sightlines were changed a bit," the goalie explained. "So it was nice. I maybe needed a little break, too. The power play was kind of buzzing there," Demko said with a smile. "Responsibility without the puck, that was the difference. But I can't complain, we had a heck of a game," he said. It's important that the team uses the time off, Okposo said. "The last week-and-a-half we have made some mistakes, we haven't gotten the results we wanted and when we come back we have to push," he said. "There's no bones about it, we're outside of a playoff spot right now."